These include high-end drawer microwaves, to built-in microwaves to countertop microwaves to even portable microwave. It’s hard to keep up with technology and microwave ovens are no exception. We’ll break down each major microwave category and tell you which one we think is the best in its category, why we think it is the best and the pros and cons of each model to see if that model will work for you. You can use the table of contents just below here if you want to skip to any specific type of microwave or just continue scrolling to see each one. Who Is The Sharp SMD2470AS Best For? Panasonic NN-SD775S Or NN-SD975S – What’s In It For Me? What Are The Dimensions Of The NN-SD775S And The NN-SD975S? Who Is The NN-SD775S Or The NN-SD975S Best For? What Are The Toshiba ECO42A5C-BS Internal Dimensions? Who Is The Toshiba ECO42A5C-BS Best For? Who Is The Toshiba EM131A5C-BS Best For? What Are The Toshiba EM925A5A-BS Measurements? What Are The Toshiba EM925A5A-BS Features? Who Is The Toshiba EM925A5A-BS Best For? Drawer microwaves are pretty much what you would expect by the name. These microwaves are designed to fit in a kitchen cabinet under your kitchen counter, on in a kitchen island, and to open as you would a drawer in your kitchen. These microwaves are typically larger than conventional microwaves and can be very convenient to operate. As a result, they are among the most expensive. 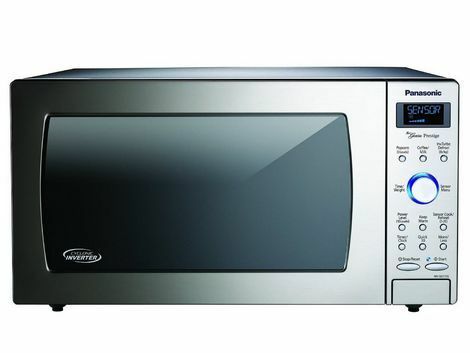 Our choice for the best drawer microwave is the Sharp SMD2470AS 24-inch Microwave Oven. This 1.2 cubic foot capacity and 950 watts of power. Sharp is pretty much the only manufacturer of microwave drawer ovens, even those made for other brands. Chances are if it’s a drawer microwave, it’s a Sharp, even if there’s a different name on it. These Sharp mircowave also have had their share of defective models, so we definitely recommend buying an extended warranty when you buy one (see options below). The controls for the Sharp SMD2470AS can be tucked away when you’re not using them and instead show a smooth stainless steel finish that works well with your designed kitchen. 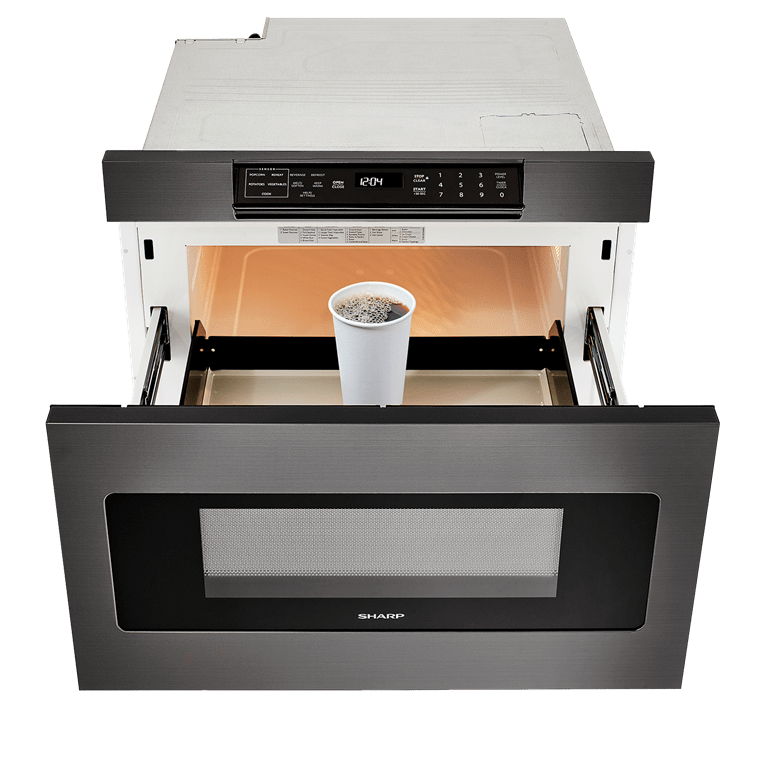 Since drawer microwaves are typically mounted below your countertop, you access your microwave just like you would pull a pot out of one of your kitchen drawers instead of reaching up as you would for an over the range microwave. The Sharp SMD2470AS is best for those with designed kitchens, including islands, that want their appliances out of the way but still easily accessible. They are also larger than most microwave ovens, with a gross capacity of 1.2 cubic feet versus an average microwave capacity of about 1 cubic foot. You can see the Sharp SMD2470AS on Amazon here with current pricing, any discounts and current extended warranty options. Built-in microwaves, like drawer microwaves, are designed to be built into kitchen cabinets. Built-in microwaves are typically installed in cabinets above the countertop, unlike drawer microwaves which are typically installed below the countertop. Some built-in microwaves can also be alternatively used on top of the countertop and so can also be countertop microwaves, like this Panasonic microwave. So, if you decide that you want it on your countertop instead, no problem. These Panasonic microwaves are very powerful with 1,250 watts of power. The NN-SD775S is 1.6 cubic feet inside and the NN-SD975S is 2.2 cubic feet inside, that is the only difference between these two models. These Panasonic microwaves also have “Cyclonic Inverter” and “Turbo Defrost” technology. Panasonic claims these technologies are more efficient for cooking edges of food, for defrosting and for evenly cooking dense foods better than conventional microwaves do. Panasonic’s microwave technology is designed to prevent “cold spots” or unevenly defrosted or unevenly cooked foods especially dense foods from emerging from your microwave oven. Additional technology in these Panasonic ovens includes sensors that are designed to detect when foods are sufficiently cooked then alerting. The other thing to note about the NN-SD775S is that even though it’s described as a “built-in”, the NN-SD775S also works as a stand alone countertop oven. When operating this Panasonic as a built-in, you would most likely purchase a trim kit to like this one below to make the oven flush with your cabinets. You won’t need a trim kit when you use the NN-SD775S as a stand alone countertop microwave. The NN-SD775S and the NN-SD975S are powerful microwaves and despite the new technology that Panasonic has built into it, a lot of customers have experienced touchpad malfunctions or other electrical issues. You should definitely buy an extended warranty to protect yourself against malfunctions. The standard warranty is only good for one year, so you definitely need an extended warranty (see below for warranty terms and prices). The extended warranties offered on Amazon below are fairly cheap and probably worth buying the longest extended warranty offered. These Panasonic microwaves are best for those who want a built in microwave (or even as a stand alone countertop) with a lot of power and cooking functions. Keep in mind that some have experienced malfunctions with these microwaves and know that Panasonic only provides a one year warranty. So, we recommend buying an extended warranty for either model that you buy. These warranties are relatively inexpensive so buy the longest term warranty that is available if you can. You can see the latest warranty options, pricing and any discounts on Amazon. The Panasonic NN-SD775S on Amazon is here and the Amazon link for the Panasonic NNSD975S is here. Convection microwave ovens combine a traditional toaster or countertop oven (for the most part) with a microwave. It’s tough to combine these two types of cooking in one oven. Most combination microwave and traditional countertop ovens do are not as good as either a microwave or a toaster.countertop oven by itself. Convection cooking uses this fan to blow hot oven air around your oven so that traditional, oven cooking functions using convection cooks evenly. The Toshiba ECO42A3C-BS is a combination oven that does the best job of traditional baking and microwaving. Note that it is large, 1.5 cubic feet of gross size, it’s almost 22 inches deep and wide and about 13 inches high, so make sure you have enough room in your kitchen. You also have to leave room around your oven for venting. The internal dimensions are 15.5 inches wide, 15.35 inches deep and 10.2 inches high. Among other things, this oven like other convection ovens, have a fan in the back of the oven for convection cooking. This is one reason that the oven is large and it also reduces the size of the interior of the oven by the amount taken by the fan. This combination convection and microwave Toshiba oven is our recommended option for cooking conventionally and as a microwave in one oven. You won’t be able to do absolutely everything that you want to do in a conventional toaster oven, like broil which this oven doesn’t have, it’s a trade-off to be able to get both in one oven. We find that this oven does a good job in mircro-waving and conventional cooking. Note that this oven comes with only a 1-year warranty. We recommend that you buy an extended warranty with this oven since appliances like this oven fail over even one year of ownership. You can see the Toshiba ECO42A5C-BS on Amazon with current pricing, any discounts and extended warranty options here. Countertop microwaves fit on your countertop, as you might expect, but some can alternatively be built into cabinets. 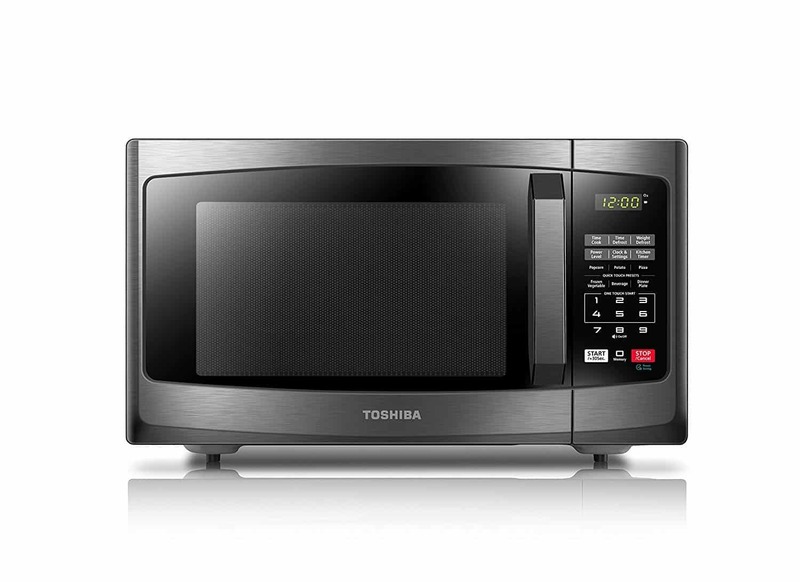 We like the Toshiba EM131A5C-BS as the best countertop microwave oven. 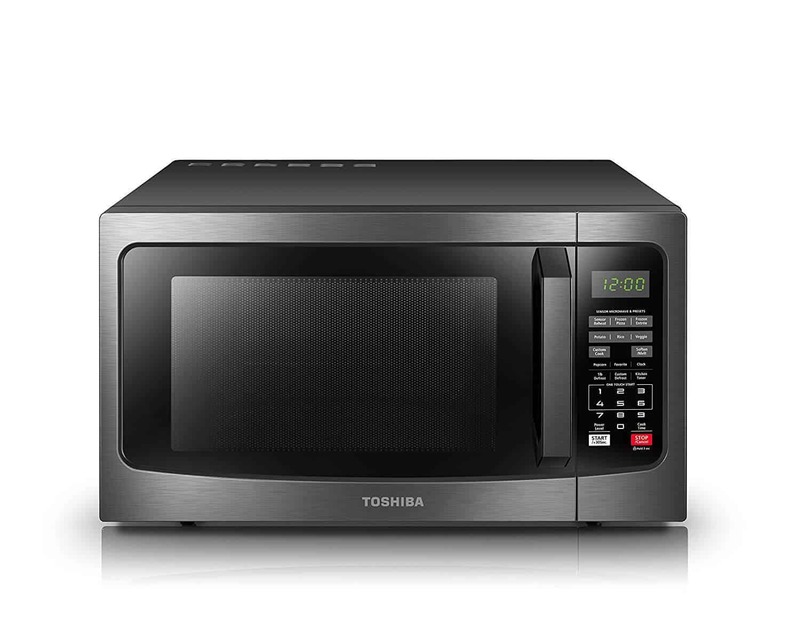 This microwave is similar as a microwave to the Toshiba microwave convection oven reviewed above, but smaller since it doesn’t have any of the conventional cooking elements. This Toshiba has a lot of functions and features. The EM131A5C-BS is best for those who want the a lot of functions, an easy to use sensor and a microwave that doesn’t take up too much space on your countertop. This Toshiba microwave is a compromise in size, power and functions that will do most microwave cooking easily without fuss. The sensor technology is designed to help you know when your food is done by measuring how much steam is coming out of it. Like a lot of the microwaves reviewed here, the EM131A5C-BS has had its share of defective models. Also like the other microwaves reviewed here, the manufacturer warranty only lasts for one year. That is too short, you definitely need an extended warranty if you buy this Toshiba model, or any of the microwave ovens reviewed here. The extended warranties available on Amazon (see link below) are not expensive and we recommend buying the longest extended warranty available to give the best protection possible. These extended warranties are typically much easier to work with than a typical manufacturer’s warranty. You can see current warranty options, including all warranty terms as well as current pricing for the Toshiba EM131A5C-BS on Amazon here. Compact microwaves are typically less than 1.0 gross cubic feet of interior cooking space. Some of compact ovens may also even be considered portable if you want to unplug them and take them with you, but most people won’t. Our vote for the best compact microwave oven is the Toshiba EM925A5A-BS and it has 0.9 gross cubic feet of interior cooking space. Compared to the large exterior Toshiba convection-microwave combo EC042A5C-BS reviewed above, the EM925A5A-BS is much smaller. The exterior of the EM925A5A-BS is 19.1 inches wide, 16.1 inches deep and 11.5 inches high. It also weighs just over 27 pounds. By comparison, the large Toshiba convection microwave is 21.7 inches wide, 21.4 inches deep and 12.8 inches high AND is weighs almost 45 pounds. So, compared with the Toshiba convection microwave, the Toshiba EM925A5A-BS is compact, clocking in at 59% of the total exterior volume of the bigger Toshiba ECO42A3C-BS. We used the ECO42A3C-BS as a comparison because it’s the largest microwave oven that we review here. This Toshiba is rated at 900 watts and has a 10.6 inch diameter glass turntable to rotate while cooking and microwaves in manual mode or six automatic modes. Those automatic modes are: pizza, potato, popcorn, frozen vegetable, dinner plate and beverage. 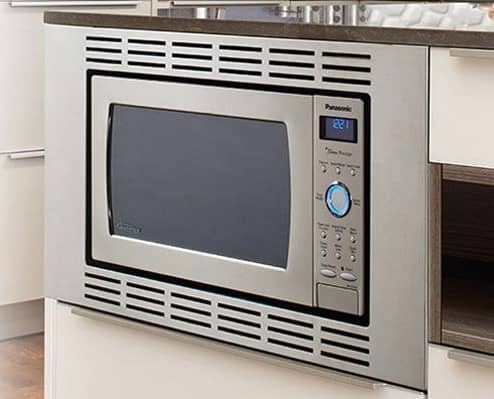 This smaller microwave is best for you if you have a small kitchen OR if you want an additional, easy access microwave to use for quick microwave jobs in even a larger sized kitchen. We recommend buying an extended warranty with this Toshiba microwave, since the warranty that comes with it is only good for one year. One year is too short for small appliances like these since they often fail after a year or two. Check the price below but most of the extended warranties are fairly cheap, even 4 year extended warranties and are worth the comfort of knowing you have extended protection. You can see the Toshiba EM925A5A-BS on Amazon here and check latest pricing, discounts and the extended warranty options. We hope you’ve found enough options for choosing your next microwave and have covered enough categories to find what you most need in a microwave oven. You may also want to see some of our other small appliance reviews if you need something else. These other reviews include Cuisinart Ice Cream Makers, Bunn Coffee Makers, the best blenders, and the best countertop ovens.